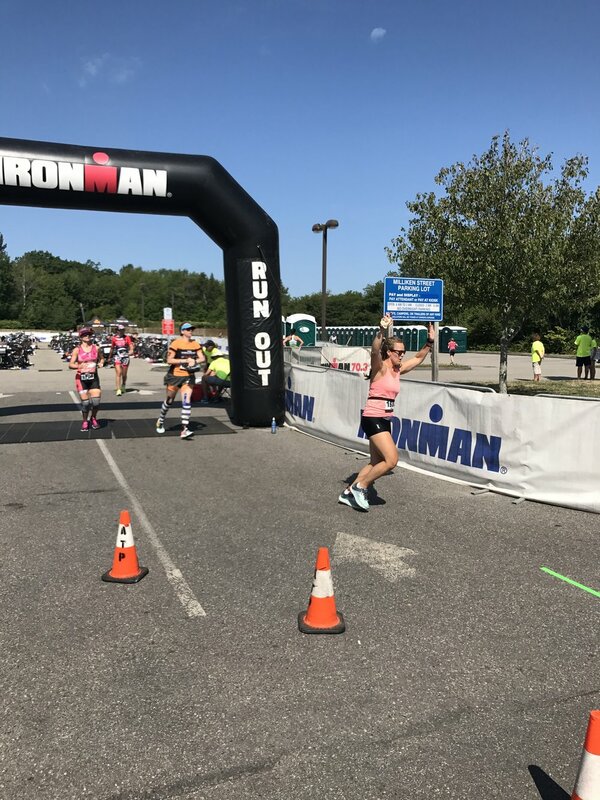 *RECAP* Ironman 70.3 Maine... Hint: I Survived! 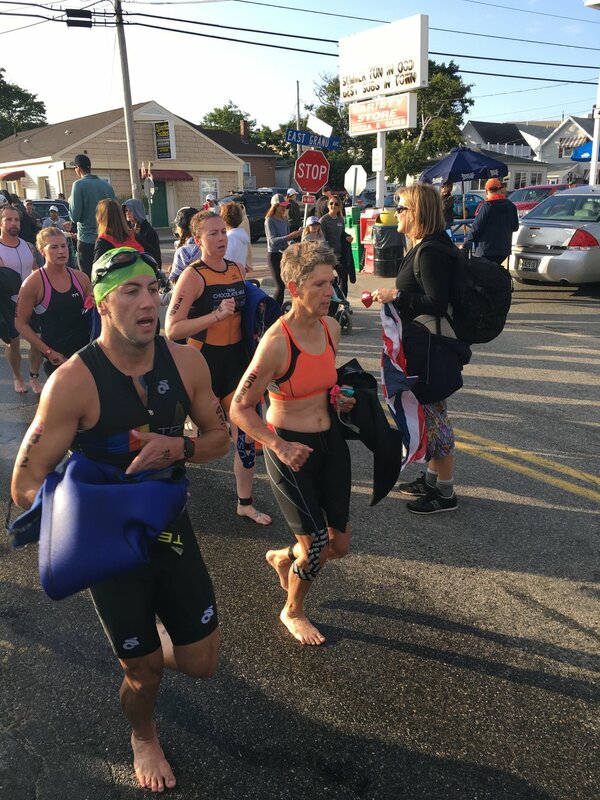 The week leading up to the Ironman Maine 70.3 race (yes that one I completed at the end of August), I had nightmare after nightmare where I didn't finish the race: big waves in the water, flat tires on the bike and my legs just giving out on the run. So needless to say I was a nervous wreck going into race morning... let's get right into the recap. Shall we? The wife and I headed up to Old Orchard Beach, Maine (an easy drive from Boston) on Saturday morning. We picked a random hotel up there and lucked out to being RIGHT around the corner from the transition zone. SCORE!!! We headed straight to the expo when we arrived. 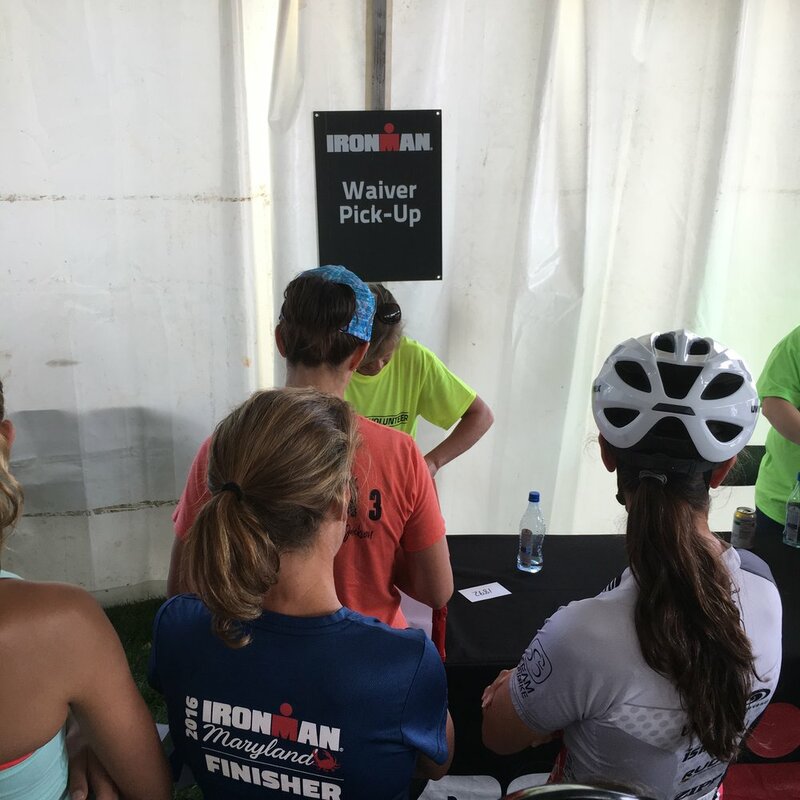 Thankfully it was easy to navigate bib pick-up and I breezed through collecting my bib/arm tats/timing chip/etc. After racking my bike and wishing Roxie a good night sleep, we headed out for a quick lunch before checking in to our hotel. Ahhh this was truly happening. 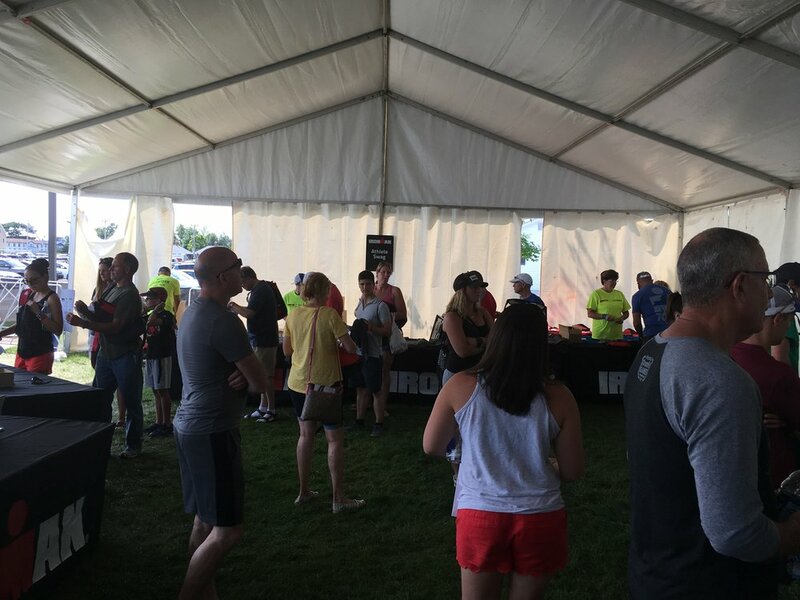 Half Ironman #2 and my first Ironman branded race. Can you believe that logo was made completely out of duct tape? Crazy! Once we were checked into our hotel, we took the opportunity to put our feet up and for me to lay out my stuff for the next morning. It would at least help to alleviate a small part of my anxiety. The alarm was set for 4am so I could be up and prepped before transition opened at 4:30am. The race would start at 6:20am so I wanted to make sure I wasn't taking any risks of cutting it close. The swim start would be a rolling format rather than waves so you had to seed yourself. I wanted to make sure I got in line early so I could have as much time as possible in the water. I know they still started the 1 hour and 10 min when you hit the water, but still it put my mind at ease if I wasn't towards the back. There were aids in transition to help pump tires and give the bike a once over. Even getting into transition when it opened there was already a line with these guys. Luckily they were able to quickly check Roxie out and fill her tires. As I mentioned above, a flat tire is one of my biggest fears. The wife and I practiced it the week before so I would be ready, but I've still only had 1 since getting my bike in May 2013. To ease my mind, my wife printed out directions, laminated it and stuck it in my bike bag. Having that there really did relieve my anxiety a little. I took a quick swim to see how the waves were behaving and to see how truly chilly it would be. :P Well it was freakin' cold for sure (haha), but the water was pretty calm (YES!)! I kept that trip to the water short and sweet since I knew I would have my fair share of the water coming up. I came out of the water and went to get in the line to Start. O-M-freakity freakin-G the line was already down the beach by the time we headed that way. Geez! Thankfully the wife offered to wait in line with me since it would be awhile. Now I didn't talk a lot because I was freaking out internally, but having the wife next to me honestly was all I needed. After what felt like hours (but was really like 20-something minutes), it was my turn to start! It was a straight-forward course: swim, turn left, swim, turn left, and head to shore. Alright I got this. I LOVE the swim portion of the course so I was in heaven. I had new goggles so I could actually see what was going on in the water. I didn't feel congested by other racers. I was in my groove and didn't want the swim to end. I took the first left turn and just stayed in my own zone. I was able to easily pass folks and didn't feel clawed at when other racers tried to get around me. This was the second-best experience during a race - only behind my first half ironman swim, which was in a lake. It's nice not being able to see my watch at all because I don't think about pace or how long I've been in the water at all. I was just focusing on my breathing and my strokes. I just checked off each buoy as we passed them. Yellow were markers and the orange meant we were turning. We took the second left turn and were headed back towards the shore. I tried to soak in the fun of the swim since my least favorite portion was coming up next. Now I was determined to enjoy every second of this race so I took the opportunity to have a little one-on-one with myself and set that expectation again. 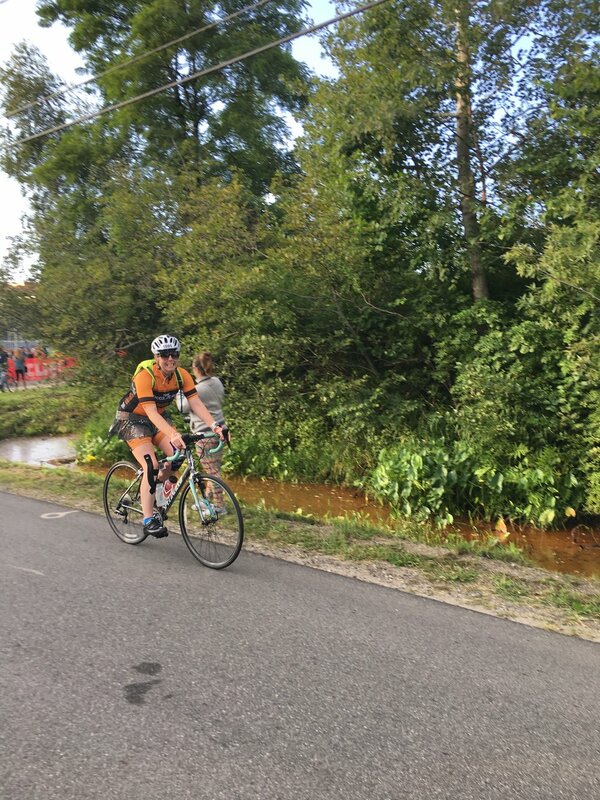 I would enjoy the bike just as much as I enjoyed the swim. It was a celebration of my health that I am able to be in this race so do it for those that can't. The shore line was in my sights. I repeated: swim until your fingers touch the bottom then stand up! We then started the 1/2 mile run from the beach to transition... on asphalt... with no shoes. So let's say using the term "run" was a lie. I waddled to transition and tried not to step on any rocks. Luckily the street was lined with spectators and even the wife! It made me smile to see her out there snapping pics... where you can see my undies! Sorry folks. Our swim time included the wetsuit removal and run to transition so it appears slower than I actually swam. So seeing a pace under 2min including all that made me smile ear to ear! Since my wetsuit was off, the hardest part of transition 1 was already taken care of! ;) I actually found my row without running past it (BIG WIN for me)! I took my time getting ready for the bike and making sure to eat a luna bar before heading out there. I also took an extra long swig of pedialyte since I am horrible at drinking while on the bike. Since I fear reaching down to get my waterbottles, I had my camelback on for good measure. With my helmet on, sparkly skirt snapped on to my trikit and snacks loaded into my bike jersey, I was off. Alright Roxie it is you and me for the next 3-4 hours. We all know the bike isn't my favorite part and my weakest (huh wonder why), but as I said I was determined to enjoy every second of this race. The wife catching me as I left transition and headed out to explore Maine. We had driven the course the day before and let me tell you - that never works out for me. I was scared of the rolling hills and was hoping I'd be ready for it. Folks I wish I could've had my phone with me because I would've LOVED to share the scenery with you all. Gorgeous typical Maine farms and forests and animals. Oh the course was definitely beautiful enough to distract me from what I was doing. I was actually passing people, which never happens with me. I was getting passed like always, but I was getting quite a few compliments on my skirt while they did it. Let's ignore my belly roll and focus on the fact that I am smiling while biking! Hey-o! Another victory. The biggest victory of the day was that not only did I snack while moving, I also drank out of BOTH water bottles on my bike while moving on the bike. I DID IT!!! Do you UNDERSTAND how big that is for me? I was so freakin' proud of myself and couldn't wait to tell the wife post-race! It wasn't until about Mile 45 where I was seriously ready to be done with the bike portion. I spent the rest of the ride thinking about timing and making sure I had plenty of time to finish within the 8-hour time limit. I only had 11 miles left and they were the toughest miles of the day. I was mentally falling off the wagon. I used all of my reframing tools to bring myself back into the moment. My legs were tired and I just wanted to run. 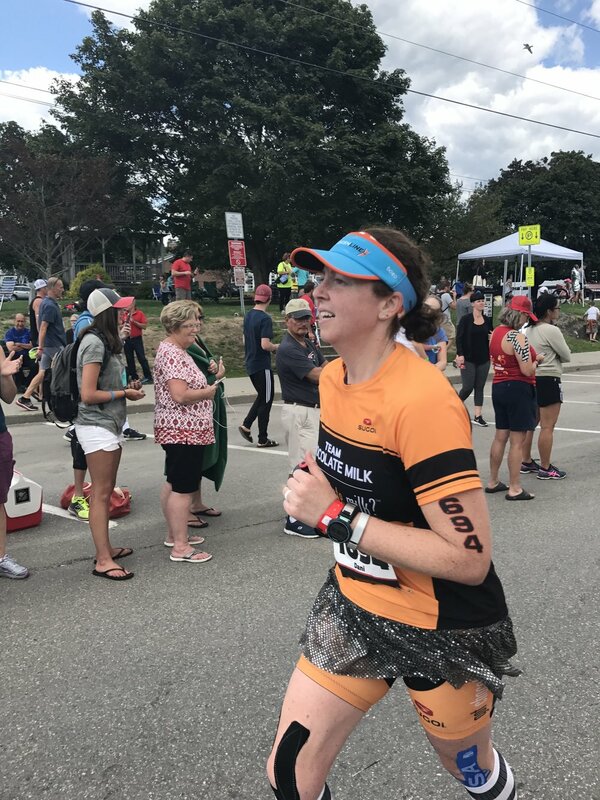 As we neared the transition, I saw the runners coming towards me and I refocused on cheering them on! Alright I was getting closer to conquering this beast. The final mile was all about weaving around transition to make it back on the right side. YAY! I spotted the wife and my friend Nacole. Wicked awesome seeing both of their smiling faces! We all knew how excited I was to be heading into transition. And you know what? All those Flywheel classes paid off. 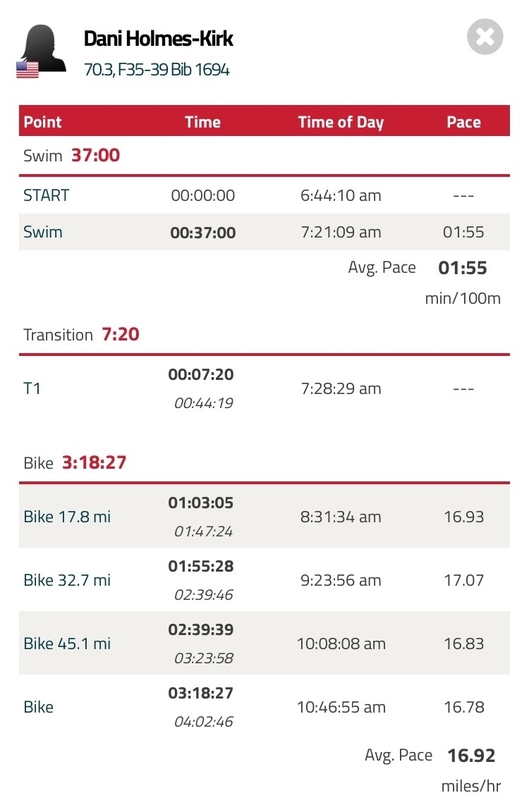 I was over 6 minutes faster on the bike course than I was during my first half ironman in 2014!!! Oh friends did I have to pee so bad. I tried with all my might to pee while riding my bike, but I had serious stage shy and my bladder would not cooperate. 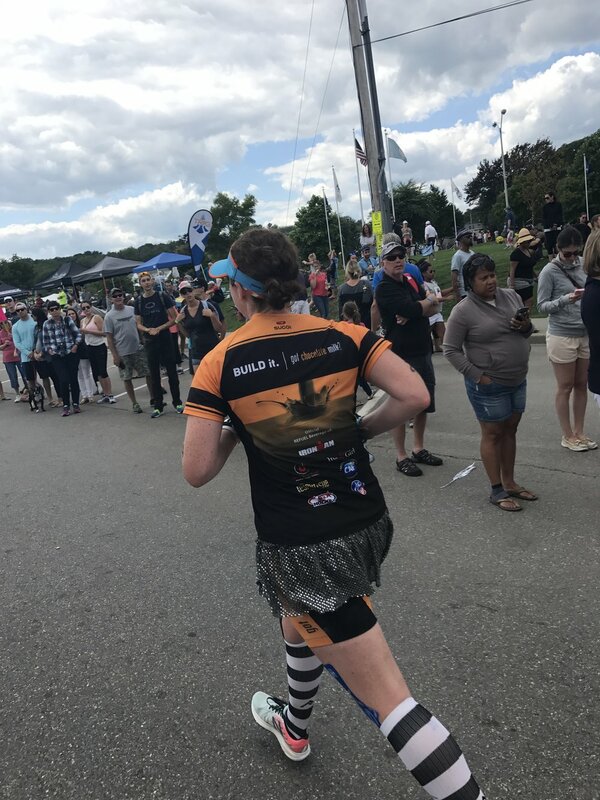 So I changed into my running clothes as quickly as possible (which wasn't THAT quickly since I added my PRO Compression socks :P) then headed straight to the port-o-potties in transition. Thank you Ironman for having a TON of port-o-potties available. During the first mile I ran into my friend Ross and we spent a little time running together. It was his first half ironman so I was excited to hear how it was going. He had passed me on the bike so I was excited to catch him on the run. We bid each other well and I headed off. After a few miles on the road, we made our way on to the Eastern Trail. We would be running and out and back here through the Scarborough Marsh. Oh friends it was beautiful and flat. I was high-fiving and cheering folks on. I was excited to be able to chat with people again (something I miss during the bike). I didn't know what my pace would look like, but I wanted to listen to my body as much as possible. If I needed to walk I would. The goal was to just walk around the water stops. I was happy to look down and see my pace in the 8s. If I could keep this up I would hit a sub-2 half and would be pretty stoked with that. But again there was a lot of run left. I enjoyed chatting with a guy who was wearing a Cubs bike jersey. He was out there because he bet his friends he would complete a half ironman if the Cubs won the series. Oh I love stories like that. He and I leapfrogged a bit so it was fun sharing some Cubs stories with him. I had plenty of Gu in my handheld and was sure to have one every 4 miles. I also had more pedialyte in my handheld since my stomach has been having some weird reaction to Gatorade this year. I highly recommend it to everyone. Could you tell I was enjoying myself? I also have to say adding snaps to my trikit was a big score. My Sparkle Athletic skirt didn't move an inch! Everything was plugging along swimmingly until Mile 9. Insert immense foot pain in my heal. Oh sweet baby Jesus it hurt. I actually stopped at the water stop and took my shoe off to see what the heck was going on. A kind volunteer came over to help me so I wouldn't tip over while trying to maneuver my shoe. I asked if he had any beer. He laughed and said no. I said how could you let that guy volunteer with that yankee hat on. They said I know. Needless to say I was doing crowd work to distract myself from the weird pain that came out of nowhere. I retied my shoe, thanked everyone and tried to run on. Oh friends. Have you had that moment where you watch your pace just slip away from you? Well that was happening live. Now my Garmin watch (Forerunner 735xt) was already bothering me because it was freaking out and beeping at random times. It might go 1 mile then beep or it would beep every 0.1, 0.15, or 0.62 miles. Talk about annoying when you can't listen to music or a podcast to drown it out. But I trudged on. By this point I had a 5k to go. We were off the trail at Mile 11 and all I could think about was I can do anything for 2 miles. Don't ask me where I got that. But I was trying anything to not run on my heal: I was running on my toe. I was walking. I was skipping. I was dancing. Nothing worked to alleviate the pain so I thought. If nothing else is working, I might as well run since that will get me to the Finish faster. Well that must've worked because my pace started dropping to lower in the 8s. As I said I promised I would stop at every water stop and yes that meant Mile 12.5. I got water and chatted with a fellow runner before we started off towards the Finish. This is where it hit me. I was going to do it... again. I was going to finish my second half ironman. Me the girl that at 235lbs could barely motivate herself to get off the couch. The girl that had back surgery and wasn't sure she'd be active again. The girl that she'd always be on the sidelines. Needless to say there were a TON of tears flowing as I saw the Mile 13 marker. Right after that I spotted the wife. I was ready to run down that carpet and leap across that Finish. **Even with the heal issue I finished my half 11 seconds faster than my first half ironman!! I think my smile says it all! The finish chute was pretty small so I was quickly reunited with the wife who is the best and met with at the finish with pier fries. We headed to the Ironman store so I could buy my celebratory backpack! I had my eyes on it and told myself I could only by it if I finished. Once the backpack was secured, it was time to grab a celebratory beer before I picked up my bike from transition. Ironman puts on an outstanding race. The aid stations were on point, volunteers full of energy, and water stops stacked with water and gatorade. 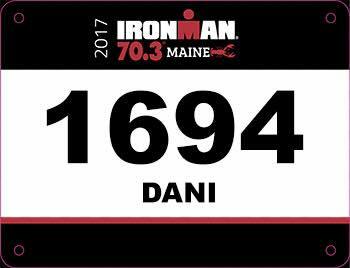 I would DEFINITELY recommend this race to anyone looking for an Ironman 70.3 to tackle.